In the Jarama Series, The Volunteer Blog will present a series of articles examining the experiences of volunteers in the Abraham Lincoln Battalion from its formation to the Brunete Offensive in July 1937. Articles will focus both on the battalion’s formation as well as on the individuals who served. These articles are intended to provide the reader with a better appreciation of the men and women who made up the first American combat formation in Spain. Evacuating the wounded was one of the first tasks to tackle after the attack. While the simple volume of casualties made the task daunting, the evacuation was severely impeded because many of the Dutch stretcher bearers were killed or wounded in the battle. Despite herculean efforts, the surviving medical personnel simply were overwhelmed. Many wounded volunteers made their way back to the trenches during the attack or after nightfall. Some made it back with the aid of their fellow volunteers who assisted or carried wounded comrades back to the trenches when they pulled back. The haphazard evacuation resulted in wounded volunteers scattered throughout the trenches. Due to the sheer number of wounded many remained in the trenches through the night into the morning. Because of the high number of wounded and the lack of a centralized casualty collection point many volunteers died before they could be evacuated. Surviving Lincolns were pressed into service to transport the wounded to the ambulance evacuation point nearly a mile to the rear. The Lincolns moved back into their frontline positions and settled into the day-to-day grind of trench warfare. The men cleaned their weapons and stood their appointed watch. A slow trickle of wounded and ill went to the rear. A near equal number of men returned from hospitals or went forward from the training base. The Lincoln’s long trench vigil would last another 120 days. *Lincoln Battalion Officers, undated (March 1937), Sandor Voros Spanish Civil War Collection, Series 2, The XVth International Brigade Records, Box 3, Folder 30, Adelphi University Archives and Special Collections, Garden City, NY. ** A notable omission on the organization above is lack of personnel from the Centurio Guiteras Column. Surviving members of the section are noted as being merged with the Irish Section on March 9. It is possible that at this point the surviving members were clustered in Group 3 of Section 2 under Sylvester Freidle. Arturo Corrona, who is listed as having commanded Company 2 on February 27 in some sources, is also noticeably absent from the list and may have filled the role of Infantry Company Commander which is not listed on the document. Carroll, Peter N. The Odyssey of the Abraham Lincoln Brigade, Stanford, California: Stanford University Press, 1994. Eby, Cecil. Comrades and Commissars, The Lincoln Battalion in the Spanish Civil War, University of Pennsylvania: University Park, Pennsylvania: 2007. Landis, Arthur. The Lincoln Brigade, New York: Citadel, 1968. Rolfe, Edwin. The Lincoln Battalion, New York: Stratford Press, 1939. Tisa, John. Recalling the Good Fight, An Autobiography of the Spanish Civil War; Massachusetts: Bergin and Garvey Publishers, 1985. Lincoln Brigade, undated; ll. 5-6, International Brigade (Lincoln), undated; and ll. 7, 18/2 1937. [i] The exact number of volunteers who remained in the trenches after the attack varies significantly from a low of 100 to a high of 183. (Cecil Eby, 180; Edwin Rolfe, approximately 173; Peter Carroll, 150; Arthur Landis, 100.) Cecil Eby, Comrades and Commissars, The Lincoln Battalion in the Spanish Civil War, (University Park, Pennsylvania: University of Pennsylvania, 2007), 83.; Edwin Rolfe, The Lincoln Battalion, (New York, Stratford Press, 1939), 57.; Peter N. Carroll. The Odyssey of the Abraham Lincoln Brigade, (Stanford, California: Stanford University Press, 1994),102.; Arthur Landis, The Lincoln Brigade, (New York: Citadel, 1968), 90. [ii] Carroll stated that David Jones took command of the Lincolns in the aftermath of the attack on February 27. Landis in contrast states that Phil Cooperman, the battalion secretary, took command and handed it over to Van den Berghe. Eby, in contrast, states that Cooperman refused command and the Cuban volunteer Arturo Corona commanded the Lincolns. Corona likely took command of Company 2 from Andrew Royce after his breakdown. It is likely that Corona was in command of the Battalion at some point during the action. Carroll. The Odyssey of the Abraham Lincoln Brigade, 101-102; Landis, The Lincoln Brigade, 57; and Eby, Comrades and Commissars, 75-78. [iii] Armand Van den Berghe was born on February 6, 1900 in Imeerheebe (Smeerhebbe), East Flanders (Flandres Orient), Belgium. During WW I he enlisted in the Carabiniers in 1914 and served through 1918 rising to the rank of Sergeant. After the war he attended a Mining School in Paris, France from 1920 to 1922 graduating as a Mining Engineer. His wife Marguerite (Margot) was a member of the Belgische Werklieden Partii (BWP) the Belgian Socialist Party. Van den Berghe was politically active in the Christian Folksparty in Belgium and participated in demonstrations against “Nation Belge” an anti-semitic right wing Belgian party. He received a three day jail sentence as a result of one demonstration. When the Spanish Civil War broke out Van den Berghe and his wife volunteered their services. The Communist Party cell in Toulouse endorsed their request. 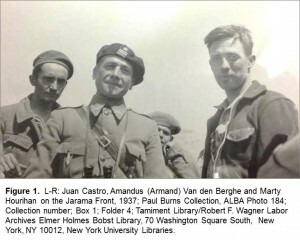 Van den Berghe arrived in Spain on January 5, 1937 and joined the XVth International Brigade as a Soldado or private in the 6th of February Battalion. Marguerite joined the staff of the hospital at Valls as a nurse. Shortly after his arrival Van den Berghe applied for membership in the Communist Party. Van den Berghe rapidly rose in rank and attained the rank of Captain on the Jarama Front. The Brigade sent Van den Berghe to command the Lincoln Battalion after the disastrous assault on Pingarrón on February 27 left the battalion without leadership. Van den Berghe turned command over to Martin Hourihan in March 1937 due to illness. After recovering Van den Berghe served on the Brigade staff and fought at Brunete, Quinto and Belchite. It appears that he moved to the 35th Division as the commander of an Engineer (Zapator) unit and commanded it at Huesca and Teruel. Van den Berghe attained the rank of Major (Mayor) by the end of the war. He is remembered as the highest ranking Belgian in the International Brigades. After the war he moved to Switzerland with his wife. Van der Berghe Biografia de Militantes, April 10, 1938 Russian State Archive of Socio-Political History (RGASPI), Records of the International Brigades Comintern Archives Fond 545, Opis 6, Delo 299, ll 33-34.; Email, Ray Hoff to Brooks, March 1, 2016, includes details on Van den Berghe from Sven Tuytens and Ward Adriaens, Vrijwilligers voor de vrijkeid. [iv] Eby, Comrades and Commissars, 92. [v] The Brigade Command could easily have regarded the actions of the men as a mutiny. All of the Battalions within the brigade took heavy casualties at Jarama. [vi] Eby, Comrades and Commissars, 85. [vii] John Tisa, Recalling the Good Fight, An Autobiography of the Spanish Civil War; (Massachusetts: Bergin and Garvey Publishers, 1985), 56. [viii] Eby, Comrades and Commissars, 85.